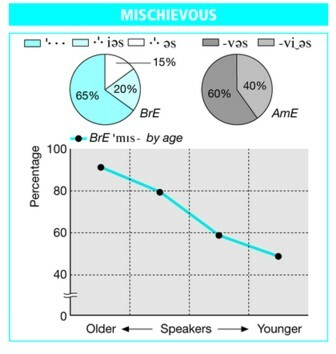 Quite a few people found it rather shocking that in my 2008 LPD pronunciation preference poll as many as 15% of the BrE respondents said that for mischievous they preferred the pronunciation mɪsˈtʃiːviəs, with the figure rising to 29% for those born since 1981. An older poll had already reported 11% of Americans preferring it, too. My problem for today is that most of those who say mɪsˈtʃiːviəs would probably want to spell it correspondingly, as “mischievious”. If they do, should we simply condemn this as a spelling mistake, or is it time to consider recognizing it as an alternative spelling? It seems reasonable to suppose that in a hundred years’ time it may have more or less totally displaced “mischievous”. Or at the very least that the OED’s characterization of it as “regional, colloq. and humorous” may need to be revised. There are several other similar cases. I have just seen the veteran broadcaster Esther Rantzen on television talking about something being prəʊˈtruːbərənt, i.e. protuberant. I do give this -ˈtruː- variant in LPD under protuberant, though with a warning triangle. Ought I to remove the triangle from “protruberant”, as I have from “mischievious”? Then what about Sarah Palin’s “refudiate” for “repudiate”? These are not exactly malapropisms, because a malapropism involves confusing the meanings of two distinct dictionary words. They’re not exactly mispronunciations, either. They’re more a recasting or regularization of what is felt to be irregular, in writing as much as in speech. Another item in the same category is 'lickerish'. Protruberant is surely not a regularization; I'd guess it's a reshaping of protuberant after protrude. There's a similar extra-syllable pronunciation for "grievous" (or grievious), as shown with the ! marker in LPD. There are rules to English; it's a shame that they cannot be summarised in anything shorter than a dictionary. I think that there are too many spelling purists for the traditional forms to be displaced for a century yet. There seems to be a spelling purist in every office I work in - like moles placed strategically to enforce the rules. Yet if they follow the pattern of mischievious and prefer homogeneous over homogenous, they'll get it right (according to those who think the subtle distinction of meaning between the two is worth insisting on). But then there's always the chance that they'll be spooked by the mischievious/mischievous question and end up saying homogenous. Although I see no mention of this in the LPD, more than once I've heard Oceana /ˌoʊʃiˈɑːnə/ from AmE speakers for what I call Oceania. I haven't had many occasions to hear speakers of other English varieties say this word, so I don't know if this is specifically AmE or not. to my young-ish, AmE ears, 'mischievous/mis'chievious is strictly an BrE/AmE distinction (as is grievous). The same goes for Oceana, which is very AmE, though without seeing it in a text I can't think which way it would be spelled.